C’EST UN TOUR DE CHANT OÙ SEUL EN SCÈNE, MAIS MUNI DE SA LOOPSTATION (MACHINE À BOUCLES), DE SON CLAVIER, SA GUITARE ET DE SES 2 MICROS, IL FABRIQUE ET ENREGISTRE L’INSTRUMENTATION DE CHAQUE CHANSON, POUR ENSUITE VOUS CHANTER DES HISTOIRES. CES HISTOIRES SONT TOUJOURS TRAITÉES AVEC HUMOUR, ET SOUVENT TOURNÉES EN DÉRISION – LE MAÎTRE MOT DE CE TCHATCHEUR/CHANTEUR. SON UNIVERS MUSICAL AMÈNE SES CHANSONS ARTISANALES À SE TEINTER DE HIP-HOP OU DE REGGAE, ETC… BREF, DES MUSIQUES DE GROOVE. CEPENDANT IL NE POURRA PAS S’EMPÊCHER DE « PARTIR EN LIVE » ENTRE UN MORCEAUX OU DEUX, SELON L’HUMEUR DE L’INSTANT… SI ! 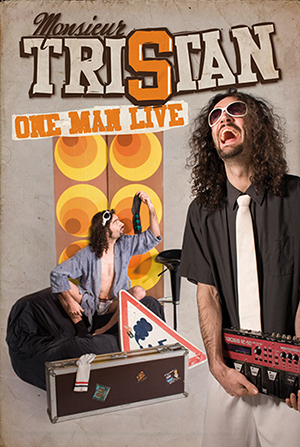 MONSIEUR TRISTAN EN ONE MAN LIVE, C’EST UN ONE MAN BAND EN ONE MAN SHOW. Photos : © Christophe Harter & Costes D.
Affiche : © David Aubert. © 2016 - MONSIEUR TRISTAN | Tous droits réservés - site web réalisé par Emmeran Richard.